The first Monday of the New Year saw a seismic shift in Santa Barbara’s live-music landscape. No longer will the Santa Barbara Bowl be partnered up with Nederlander Concerts when it comes to booking shows and delivering talent to the stage. The sandstone-studded, open-air cathedral of rock and roll atop Milpas Street is once again back in an exclusive agreement with Goldenvoice, an AEG Live company and promotion visionary behind monstrously successful festivals like Coachella and Stagecoach. By the time the 2016 season starts this spring at the Bowl, AEG Live will be the sole promoter working with the celebrated venue. The twist of fate comes in close and certain conjunction with longtime Bowl talent buyer Moss Jacobs also leaving behind Nederlander and returning to Goldenvoice, an outfit he worked for in the late 1990s and early 2000s. For more than a decade, Nederlander had been the prime player at the Bowl thanks to an exclusive contract with Jacobs, their VP of talent and mainstay Bowl collaborator. However, when Jacobs resigned from Nederlander this past November, the door was opened for a possible return to Goldenvoice for both him and the Bowl. That is exactly what was announced Monday morning. 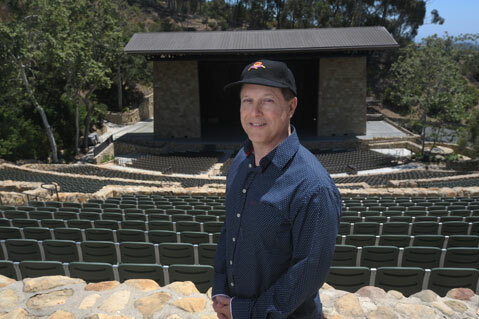 For his part, Jacobs, a Santa Barbara resident with a reputation for being consistently successful in putting Santa Barbara’s booking wants and wishes before those of Los Angeles’s, is now officially back in the fold with Goldenvoice as a senior vice president, though his day-to-day role at the Bowl is by and large unchanged. Since they first brokered a deal with Nederlander many years ago, Jacobs’s job as the primary booking agent for the Bowl has been memorialized by a “Key Man” clause in their contracts, specific language that essentially says he is the Bowl’s guy when it comes to booking, and if he is no longer with a company, then the Bowl reserves the right to terminate the contract with said company. With Jacobs out at Nederlander, the Bowl was able to opt out of their deal with Nederlander as well. Now, with Jacobs back on at Goldenvoice, so too is the Bowl back on at Goldenvoice. But what exactly that 2016 season will look like is now very much up for debate and some heady speculation by music lovers in the 805. There is no doubt that the stable of artists that AEG Live can draw from is among the most impressive and deep in the music industry. For those in attendance, the 1995 Beastie Boys show at the Bowl, the first collaboration between the venue, Goldenvoice, and Jacobs, was something that will never be forgotten.